1. Why do cows wear bells? Because their horns don’t work! (This one is obviously a joke, so laugh and go to the next fact…) There are an untold number of cow jokes, just one more use for these big old domestic animals that people can find a use for. Gary Larson, cartoonist of The Far Side, used cows in many of his hilarious cartoons. 2. There are 1.4 Billion Cattle in the World. Cattle, scientific name Bos Taurus, are the most common domesticated large ungulate (hooved animal) kept by humans. They are used for their meat, their milk, leather, as draft animals, and as providers of a variety of byproducts such as glue. Their manure is used as fertilizer and as fuel for fires, notably on grasslands that lack sufficient wood for fires. (Cow manure, usually known by a more colloquial name, is also the main product of politicians worldwide…) They are in the Bovine family of mammals, which includes Bison, Buffalos, Yaks and the Musk Ox. 3. India has the most cattle of any country. With over 3.3 million cattle, India has over 30% of all the cows and bulls in the world! China and Brazil are next, with these 3 countries possessing over 63% of all the Earth’s cattle. The US comes in 4th with 93.5 million cattle. 4. 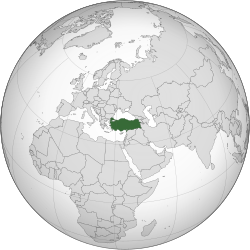 Cattle were domesticated 10,500 years ago in Turkey. The first variety of cattle domesticated were Aurochs. So why don’t we call them turkeys? We do not know. All domestic cattle are varieties of the same species, and most other species of bovines can successfully mate with cattle, but not African Cape Buffalo and Water Buffalo. (American Buffalo/Bison hybrids with Cattle, called “Beefalo” are common in the US.) Scientists believe only about 80 individual cattle made up the basis for the entire domesticated herd as we know it today! The 2 main varieties of domesticated cattle are the dairy variety, raised to provide the maximum amount of high quality milk, and the beef variety, raised for providing meat. Other varieties have been selectively bred to prosper in a specific climate, or to provide maximum thrills at a rodeo or for bullfighting. There are a staggering amount of “breeds” of cattle, perhaps 800 to 900 different recognized breeds. Colors, sizes, and shapes vary enormously among the breeds. 5. Cattle keeping has a tremendous impact on the Earth’s environment. Our tremendous use of cattle around the world results in around 80 Megatonnes or more of methane gas produced per year, a whopping 18% of all the greenhouse gasses produced in the world (the stuff that makes global warming/climate change) from all sources, or 37% of the methane produced by living things. (Methane is many times more of a greenhouse gas than carbon dioxide.) Keeping cattle in confined areas results in runoff of their waste products that can poison local water supplies, and overgrazing can damage plant diversity. 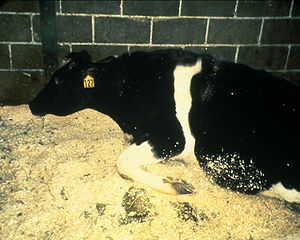 The concentration of cattle can lead to epidemic diseases, which can devastate the cattle or affect humans, such as Anthrax and Mad Cow Disease. Filling cattle with antibiotics and hormones also poisons our water supplies as these chemical compounds are passed in the waste products of cattle into the environment, not to mention the negative impact, barely understood at this point, on the people that eat meat from cattle treated with various drugs. Many countries have feral cattle roaming the countryside, which would definitely impact native flora and fauna. 6. Cattle have been icons in many communities. You may already be aware that many people in India are of the Hindu religion, and do not believe in killing cows, considering the beasts “sacred” (hence the term, “sacred cow” meaning something you dare not mess with). How about in the United States? We have the Texas Longhorns, the Dallas Cowboys, the Oklahoma State Cowboys, the Chicago Bulls, the Schlitz Malt Liquor Bull, the “Bull” statue on Wall Street, Ferdinand the Bull of children’s literature, Elsie the Cow spokes-animal, and a gajillion other iconic cattle references. Even Elmer’s Glue has a bull on its logo, indicative of where the albumen contained in the glue comes from! Ancient history gives us the Minotaur, half man, half bull, and particularly stocky or strong or “bullheaded” people are sometimes nicknamed “Bull” (such as Admiral “Bull” Halsey). The original “Air Force One” airplane that flew President Roosevelt was nicknamed “Sacred Cow.” We have Bull Durham tobacco, or at least we used to. There seems to be no end of cultural references to cattle, many of which are quite complimentary. 7. Oxen are castrated bulls. Just in case you did not know, those big, strong oxen yoked and pulling heavy wagons across the prairie are actually castrated male cattle (formerly bulls) that are adapted for use as draft animals, pulling plows and wagons and such. In some places they are referred to as a “bullock” instead of an “ox.” Not every single bull used as an ox is actually castrated, but most are. 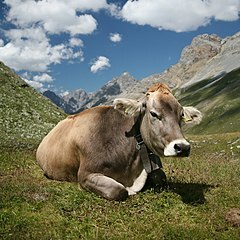 Cattle were not used as draft animals until around 4000 BC. Why not earlier, since cattle were domesticated over 6000 years before that? We do not know! Tell us if you have the answer. As with horses, when cattle are used as oxen, they are usually “shoed,” having metal plates attached to their hooves. (News to us!) Oxen are usually stronger and have better endurance than horses, though of course slower. Their survivability is far greater than that of horses, which is why the oxen predominated in pulling wagons across the American prairie. 8. Cattle can be big, really big. Domestic cattle regularly exceed 2000 pounds, and some have reached as much as 3500+ pounds. As far as land animals go, only the elephants, hippos and rhinoceroses (rhinoceri?) exceed these mega-cows. (Horse can get close to 3000 pounds as well.) The current World Record holder is a beast in Britain named Field Marshall, said to weigh 3500 pounds in 2008 at the age of 6, and still growing! One of his (now deceased) stable mates also reached a weight of 3500 pounds, with both of these monsters standing over 6 feet 5 inches tall. 9. Cattle can have big, really big horns. The largest circumference of a cattle horn ever measured was an incredible 40.75 inches around! 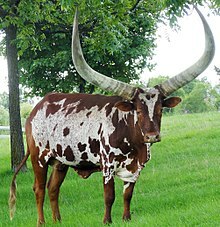 The type of cattle with these enormously thick horns are Watusi Cattle from Africa, although the record holder is from the United States. Texas Longhorn cattle can have horns reaching a spread of up to 101 inches, over 8 feet wide! Cattle without horns are known as “polled” cattle, either bred to not have horns or people destroying the horn buds at an early age to prevent the growth of horns (for the safety of humans and to avoid the animals injuring each other). Cattle do not shed their horns as deer shed antlers, but keep them their entire life. People have used cattle horn to hold a variety of things, such as gunpowder (powder horns), as cups, as ornaments, or to craft other objects such as combs, jewelry and the like. Horns are made primarily of keratin, the stuff fingernails and claws are made from, as well as hair and even the outer layer of skin. When you hear of cows “chewing their cud,” what those cattle are doing is sort of upchucking the contents of previously eaten food from a special sort of “pre-stomach” pouch in their digestive tract called the “rumen” where food that is chewed and eaten ferments, helping to break it down so that the animal can derive the nutrients from otherwise not very nutritious stuff such as grass. The cattle periodically rechew their partly digested food to give it another good going over to help break it down for digestion. 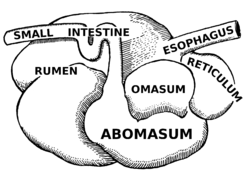 The digestive process is called “foregut fermentation.” Aside from cattle, some other animals are also ruminants, such as giraffes, yaks, sheep, goats, deer, antelopes, and even kangaroos. Carlson, Laurie. Cattle: An Informal Social History. Ivan R. Dee, 2002. Royer, Scott and Nikki. Raising Beef Cattle For Dummies. For Dummies, 2012. Previous ArticleFebruary 17, 1801: What Happens if the Electoral College Vote is Tied or No Majority?